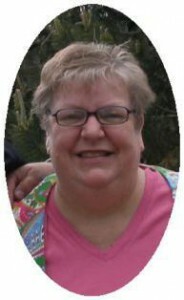 Cindy L. Kornely, 52, of Sunset Road, Port Washington died unexpectedly Sunday, June 17, 2012 at Columbia St. Mary’s Hospital-Ozaukee Campus in Mequon. She was born on December 16, 1959 in Port Washington, daughter of John H. and Bernice Didier Nault. A lifelong resident, she attended local schools, graduating from Port Washington High School. After receiving her degree in textile design from the University of Wisconsin-Stout, Cindy married Rick G. Kornely of Mishicot at Friedens Church in Port Washington on April 9, 1983. Together they started their family. For many years she had worked for the American Red Cross and volunteered with numerous parent organizations while her sons were growing up. Amongst the hobbies she enjoyed were sewing and crafting. For the past 13 years she was a software quality control analyst for ipipeline of Mequon. She is survived by her husband Rick, sons Alex and Travis of Port Washington, Her mother Bernice Nault of Port Washington, brothers Salty (Linda) and Rocky (Julie) Nault, both of Port Washington, other relatives and friends. She is preceded in death by her father John and her brother Ron “Ace” Nault. Funeral services will be held at 6PM Thursday, June 21, 2012 at the funeral home. Pastor Brandon Lemons of Friedens Church will officiate. Family will receive friends from 3-6PM Thursday at the funeral home prior to the service. Memorials of your choice are appreciated.